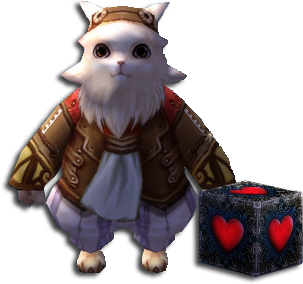 On Tuesday, July 10th 2018 8am local time we are going to enable the "Change of Hearts" event on our server. Puss the Cat, the faithful servant of Dr. Chaos, is in the villages of Aden and Elmore to play a game with adventurers who collect and trade pieces of hearts. Nine different heart pieces will drop from monsters throughout the world. Collect one of each piece in order to try your chances at a rock, paper, scissors game with Puss the Cat. After each round of the game, you will decide if you wish to continue playing or accept the prizes for the current round. When you lose, the game ends. Your prize is determined by how many times in a row you win. Losing will reduce the quality of your prize, so don’t be afraid to quit while you’re ahead! Nobody goes away empty handed! All participants who do not win a game receive a consolation prize. The end of the event drops as well as the removal of the event cats will be announced soon. Info: The event item drops end on Tuesday, July 24th 2018 after the regular maintenance at 8 AM local time. The event NPCs stay longer. Edited 5 time(s). Last edit at 22.07.2018 12:02:29 by Administrator. Hooray! New event! Thank you, Admin! Peoples keep this post updated with the rewards you get, so we know if it's worth stopping or continue gambling. Say please, what is prizes be in event? If it not secret. The event cat will tell you the rewards for this event.